Specsavers reacted to footballer Luis Suárez apparently biting Italy's Giorgio Chiellini in a World Cup match last night, with a tactical tweet pointing out the difference between cannelloni and Chiellini. Specsavers worked with its media agency Manning Gottlieb OMD to create the image using its well-known slogan "should have gone to Specsavers". The tweet at 9:57am today was retweeted more than 13,000 times within one hour. It has now been retweeted 18,606 times. 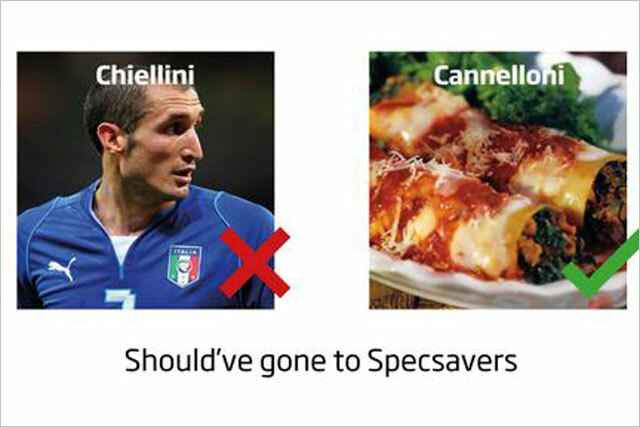 Tim Langlois, the digital marketing manager at Specsavers, said: "Topical humour has been a key feature of some of Specsavers' most memorable advertising in the past, and the Uruguay v Italy game provided the biggest talking point of the World Cup so far. "The nation has had its interest piqued by the tournament and it offers an entertaining environment to build on our brand heritage, alongside keeping our brand awareness top of mind through the summer." MG OMD used what it calls a "prepared-readiness" approach for the tactical tweet, holding a quick discussion with its client. David Bratt, a business director at MG OMD, said: "It was decided that this incident hit the mark in terms of national interest, aligned with something outside of the ordinary, which provided an ideal opportunity for a relevant SHGTS moment."